Not for nothing has New York been called the “black hole” of northeast genealogy. With a complex legal and political history (it was Dutch before it was English,1 and its court system is about as complicated as it’s possible to be2) and more than its fair share of records losses (including a catastrophic fire at the State Capitol3), there’s good reason why researching in New York can be tough. 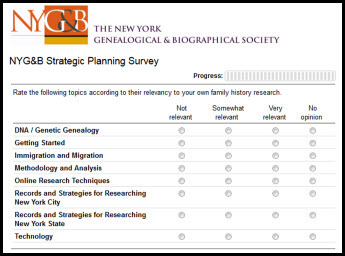 Fortunately for folks with New York ancestors, there’s help: the New York Genealogical and Biographical Society — NYG&B for short — has been around since 18694 to help New York researchers find their way through to the best that New York has to offer. If you have New York ancestors, you probably already know just how helpful NYG&B can be. And if you have New York ancestors, NYG&B could use your help for a change. And it will only take about five minutes of your time, sitting at your computer, at your convenience. Like any long-established research organization, NYG&B occasionally needs to stop, take stock of where it is and where it’s headed, and make sure it’s addressing the needs of the community it’s trying to serve. Right now, under the direction of newly-appointed president D. Joshua Taylor, NYG&B is in the midst of a strategic planning process — and it wants to hear from you! There’s a five-minute survey you can do online to help NYG&B to be able to help you better. So take a few moments — tell the NYG&B about your research interests, provide feedback on existing resources, and share your suggestions. You can access the survey online here.